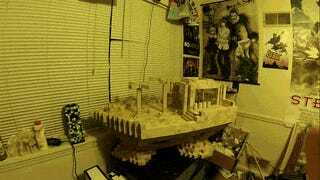 Building this replica of a Final Fantasy airship woudn't be an easy task, even if it wasn't meant to be a PC case mod. What do you do with all of that space? Well, Richard "8-Bit Builder" Clinton somehow found room for two GTX 660 graphics cards inside and even play around with the case fans, using them as lower propellers for the airship. Here's how it looked under construction, without all the hardware in it. This is not Richard's first case—you might have seen his 16-Bit Link mod and his other Final Fantasy-inspired case mod.